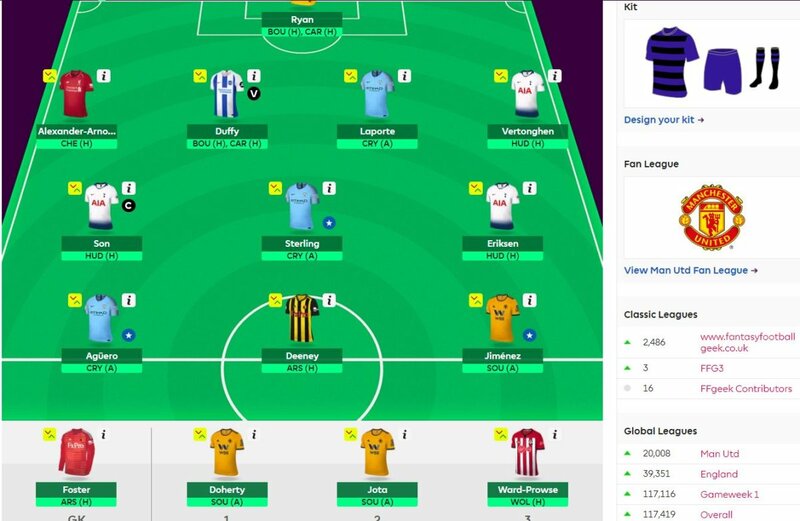 I’ve used my free hit team and activated my wildcard this week. My final transfer was Valery out for Vertonghen and Boly out for Doherty. I have £0.1m in the bank. I did think about Trippier but rotation even with Aurier injured has spooked me. You could say the same about Doherty but I think he will make it up over the course and with no FA Cup anymore and 7th a priority hopefully he will play. Son stays as my captain. I’m hoping with Alli a doubt and Kane out that he will play. Lineup was tricky. It was Deeney vs Alexander Arnold vs Jota and this is where I ended up. That’s it. Good luck to everyone. Can’t shake the feeling Son will be rested for the CL now with Kane injured. Lucas Moura and Llorente might get the nod instead of him. Exactly, it’s not a free hit team, you need to plan for the last few weeks too. Brighton remaining fixtures are terrible. Well that’s just great… Son is on the bench. Hopefully Spurs are 3 up before the hour so that he doesn’t come on and the captaincy transfers to Duffy. Yep… bloody disaster. Should have just chosen the safe option of Duffy. Was regretting it last night. Well at least he pinched an assist with the last play of the game. Hat trick for Moura… bumper return for anyone who chose him! Next time Scott, I want you to make your comments before an event, not after. Then maybe we will see who the real moron actually is. Great input Scott…. it was even better when you came on to give it before the GW started, and not you know, sat on your high horse with the luxury of hindsight. Because that’s the kind of input we all admire. Well said, Ian. 20/20 hindsight is fantastic.